AGAIN THIS YEAR- your camp experience will include an extreme adventure on the high ropes course. A high ropes course is an obstacle course 30 feet in the air. 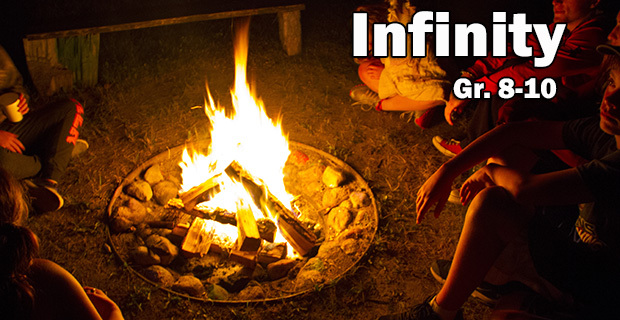 You and other Infinity campers will build incredible bonds of trust and friendship. Your course experience will be unforgettable; you will leave camp with new confidence, lasting relationships, and deeper faith. Are you ready for Camp Metigoshe like you’ve never experienced it before? Discoverers Infinity is a great new adventure for the long-time camper or anyone with a heart for adventure. At the end of the week you will say, “Discoverers Infinity is awesome!” You’ll bond closely with your fellow infinity-ers because just the Infinity campers will live away from main camp. You’ll make all your own meals and plan all your own fun. Register early because the maximum number of campers is limited to 20. Sign up soon! Camp begins at 5:00 pm on Sunday and concludes at 3:00 pm on Friday.